Christie's Contemporary Evening Sale in London on Tuesday totals at $169.897.672, 84% sold by lot and several records set for important middle-market artists. Christie's Contemporary & Post-War department has for a long time had dominance over Sotheby's. The auctions this week have been characterized by establishing records and good sales for middle-market artists rather. Christie's followed Sotheby's with a top lot by Francis Bacon and records set for Hurvin Anderson, Tracey Emin, Michealangelo Pistoletti. Jean Dubuffet, Antoni Tapies and Peter Doig. Doig's record was set within 24 hours of the previous record set at Sotheby's of $14+ million as Larry Gagosian bought Gasthof at $16.984.897. 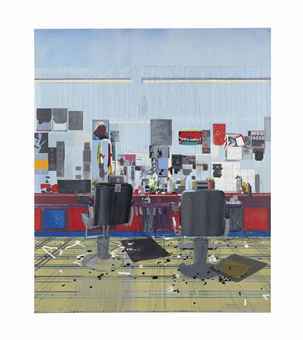 "We bid on the Hurvin Anderson," said Guy Jennings, managing director of the London-based Fine Art Fund and a former top Impressionist and Modern specialist at Christie's, "and thought we were brave [bidding] at £600,000." White Cube's Jay Jopling lost the bidding of Afrosheen the coveted oil on canvas which was estimated at $510.900 - $681.200 and finally sold for a record-breaking $2.246.481 to a telephone bidder.The piece was part of a small group of works from Charles Saatchi sold to benefit the Saatchi Gallery's Foundation. 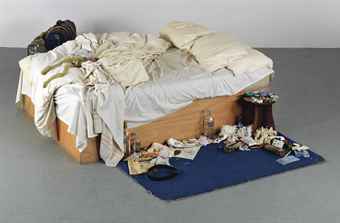 Another exciting bidding was for Tracey Emin's seminal work My Bed which finally sold for $4.351.969, well over it's $2 million high estimate setting an auction record for the artist. Asian buyer's figurated strongly in the sale. Christie's Asian Business Development manager Xin Li's client, with paddle No. 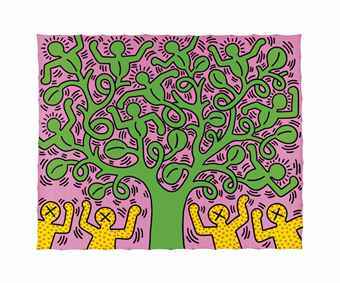 887, won Keith Haring's Tree of Life painting for $2.629.297. Another client bought Dubuffet's 1963 Le Gai Savoir for $6.840.273. The price surpassed the high estimate of and set an auction record for the French artist. See more Arts & Prints from Christie's on Barnebys here. Bokara Rug Company, Contemporary Handwoven Rug 7'10" x 9'11"